Pictured left to right: Anthony Landau (Purchase Direct Managing Director), Alison Widley (Herts Young Homeless), Hannah Coast (Purchase Direct Account Manager) and Katy MacFadyen (Purchase Direct Account Manager). We were delighted to donate £2,112 to Herts Young Homeless, an independent charity supporting vulnerable people in Hertfordshire since 1998. 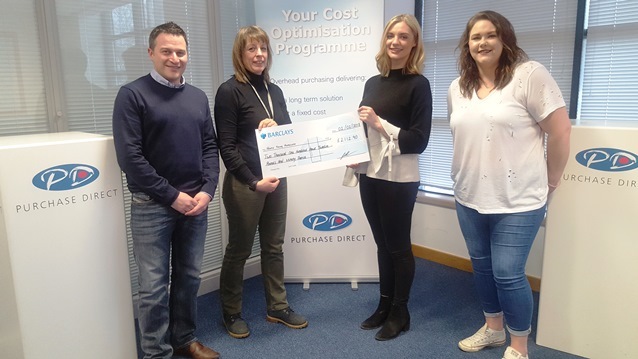 Raising funds for worthy charities and supporting the local community is important to the Directors and employees at Purchase Direct. The company holds a charity day every six months, with all employees given the opportunity to nominate a chosen charity or community project to be considered as the beneficiary of all funds raised on the day. Most recently Hannah Coast from the Account Management Team chose to support Herts Young Homeless, and as a business based in Welwyn Garden City this was a very popular choice. “When I was training to become a Yoga instructor, I volunteered to teach a class of homeless men and women, it was one hour of my time and yet the benefits were clearly evident. They arrived to class anxious, agitated and weary and yet appeared more calm and refreshed afterwards. I wanted to support the charity further and hope our fundraising at Purchase Direct will go some way to help the young homeless in our community,” said Hannah. Together with the ‘Yoga Extravaganza’ fundraising day held in the Purchase Direct office, a number of Purchase Direct employees also braved near-freezing temperatures to support the charity by joining a sponsored ‘Sleep Out’ through the night.